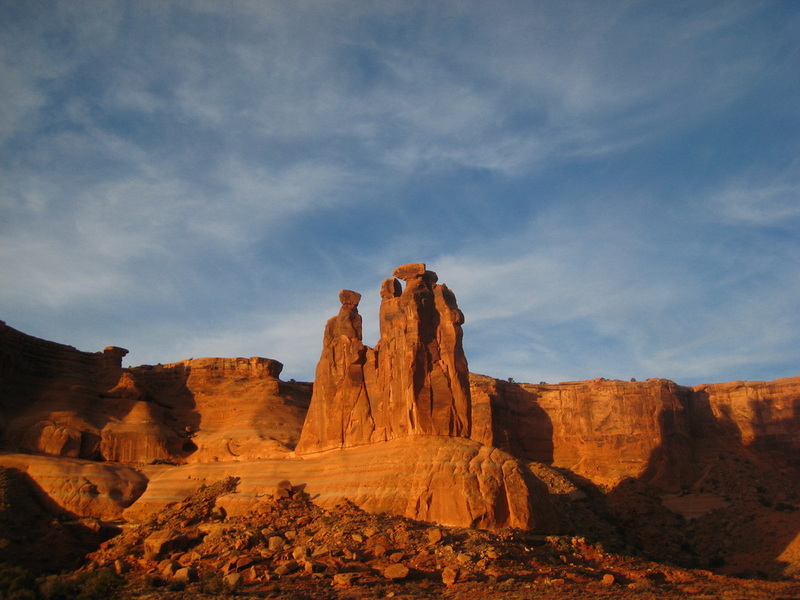 The Moab area is a very vast region with literally endless recreation possibilities. One could easily spend a lifetime exploring this area and still fail to scratch the surface. I myself have considered living in Moab but the summers are just too hot. By far the best times of year to visit this area is spring and fall. 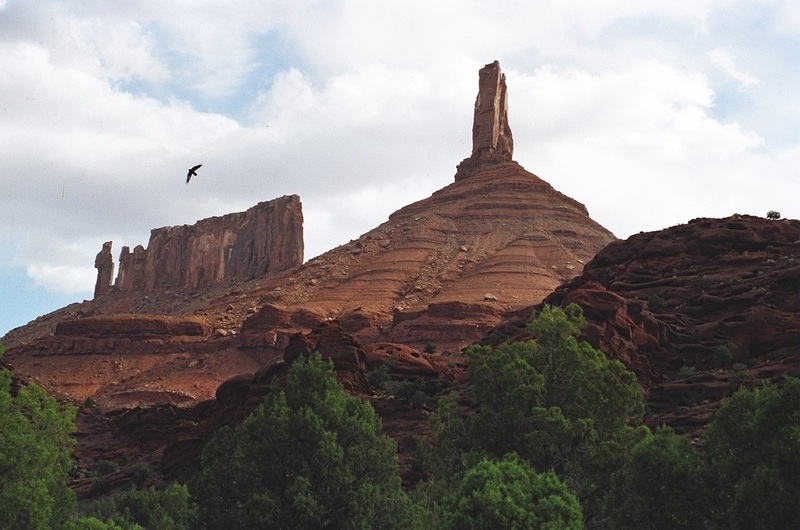 The town of Moab is a paradise for outdoor enthusiasts offering anything you can imagine. The mountain biking, off-roading, rock climbing and hiking/backpacking are the best activities in this region. Oddly enough, there isn't the spectacular canyoneering found here like the areas further west in the Robbers Roost area. 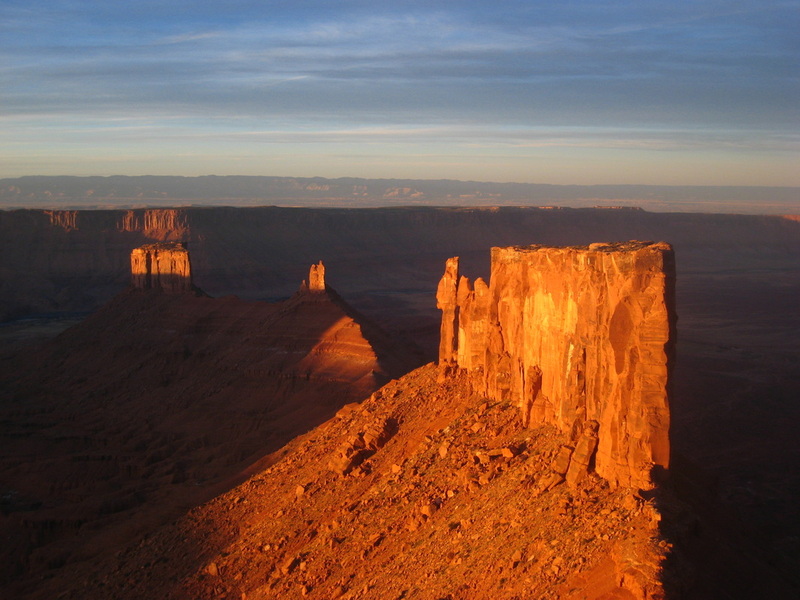 This is solely because the narrow canyon forming rock units like the Navajo Sandstone is only exposed in a few areas, and isn't exposed at all in Canyonlands National Park. The canyons in this region are all mainly large gorges that are easy to hike through. Dividing this region is quite simple actually. To the north of Moab is Arches National Park which is mostly a tourist trap now but offers many great climbing destinations. To the south lies Canyonlands National Park, which itself is divided into three large zones separated by the Green and Colorado Rivers. To the east is the La Sal Mountains which are a Tertiery aged plume that is only exposed at the surface today due to millions of years of erosion acting on the sedimentary rocks surrounding the harder, more resistant granitic plume. Rising to over 12,000 feet in elevation, the La Sals make for a summer haven away from the heat and rise over 7,000 feet above Moab. 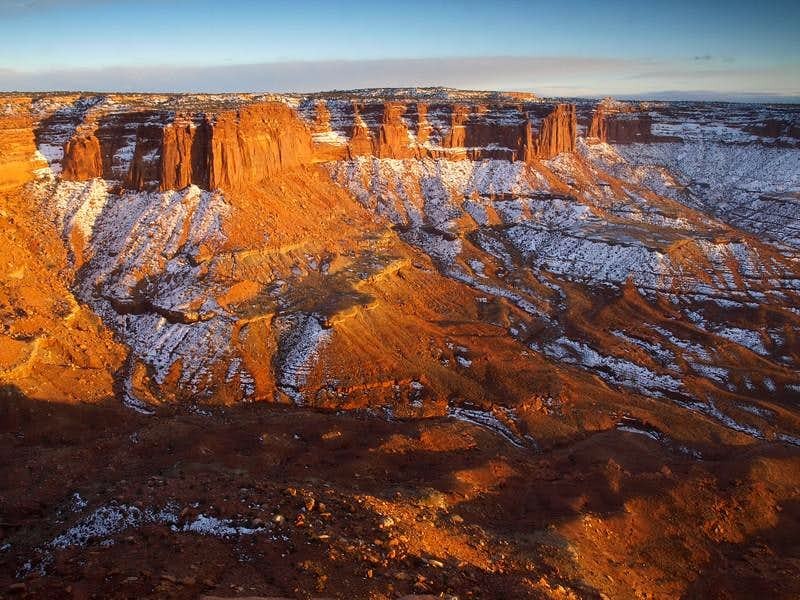 Then there are the areas directly surrounding Moab like the Fisher and Onion Towers, Castle Valley, and the Behind the Reef areas, which are among the most popular for all groups of people due to the proximity to Moab and the lack of wilderness or National Park designation. 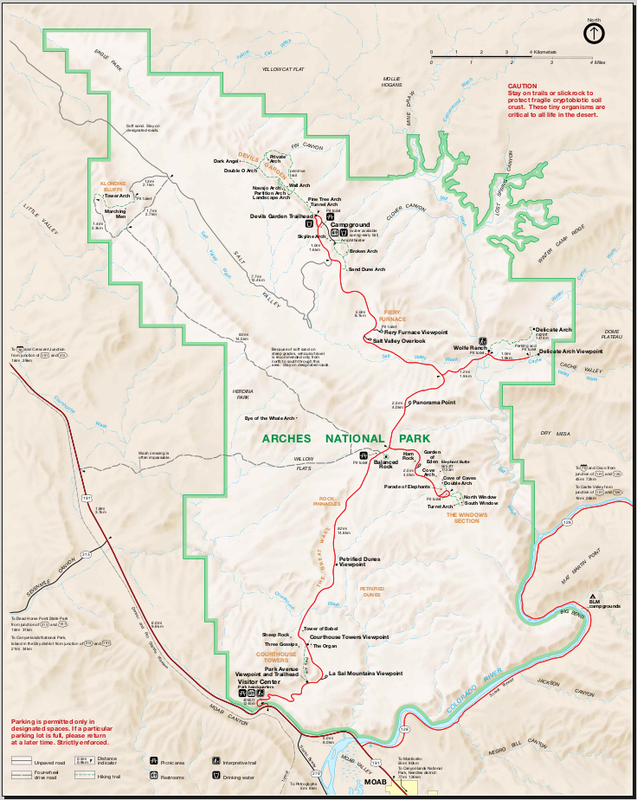 Note that the Moab area abruptly ends on the west side at the Green River and the part of the Colorado River cutting through Cataract Canyon. 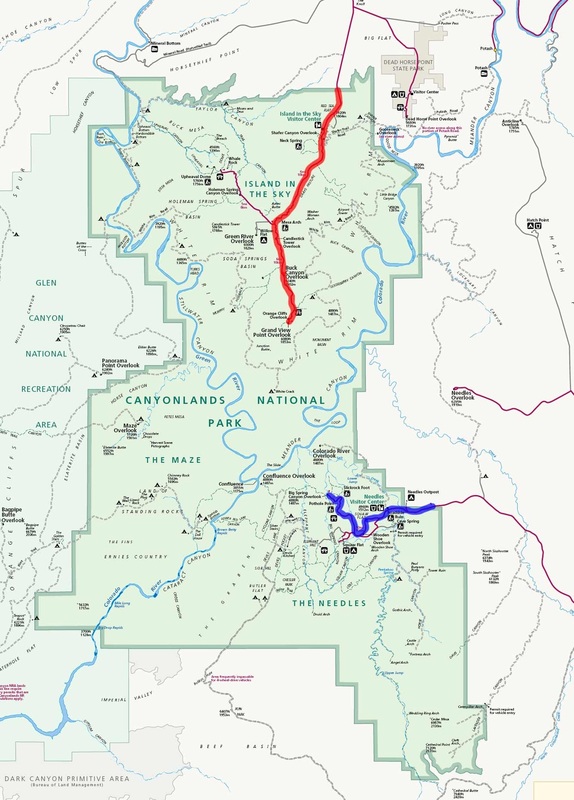 The Maze District of Canyonlands NP is technically not part of this area although I have included it. This is more of a tourist destination as of late. 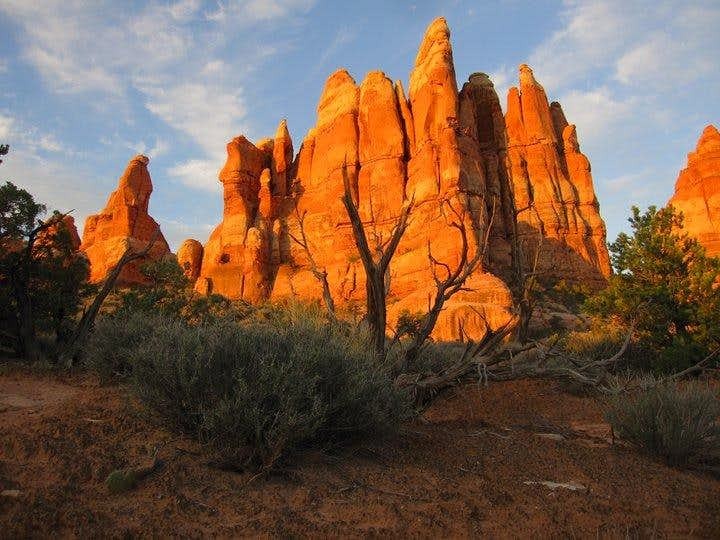 The most popular places to see is Delicate Arch, Landscape Arch, Fiery Furnace (which requires a permit and a guide to visit! ), and the Windows Area. All these are accessed by a paved road heading north starting a few miles outside Moab. Very short hikes from large parking areas take you to many large arches. 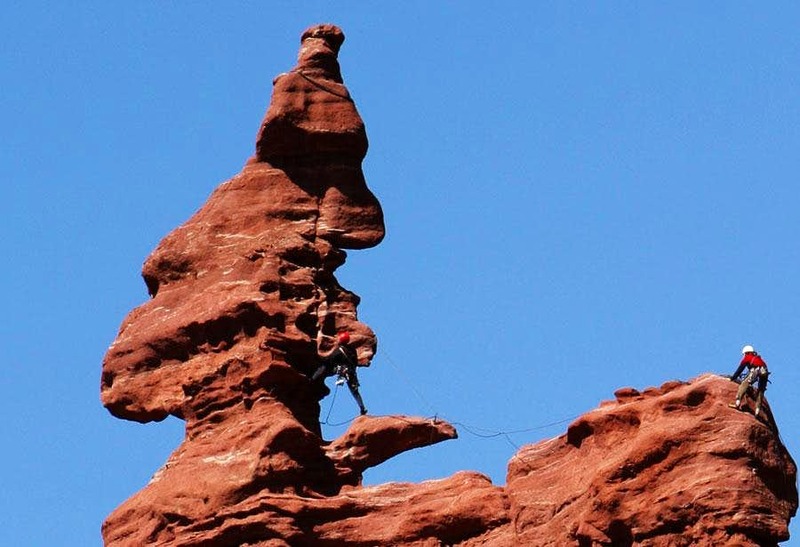 For those looking to do some climbing in this park, some of the best objectives include Elephant Butte, Courthouse Towers, Three Penguins, and any of the handful of squat towers surrounding Balanced Rock. Elephant Butte is the highest point in the park and is a relatively easy climb, but requires good route-finding and a rappel on the ascent. 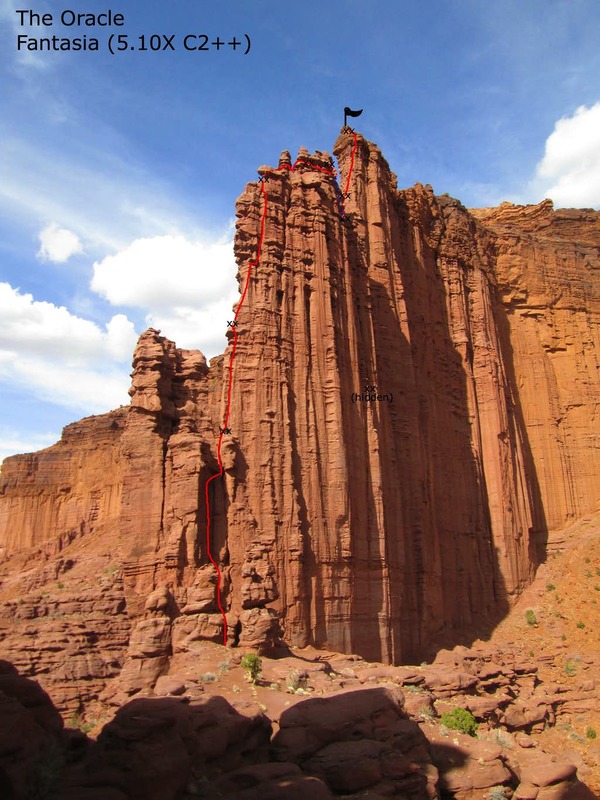 Many good aid climbs are found on the Courthouse Towers and the Three Penguins while some moderate single pitch free routes are found on small towers such as Owl Rock and Bullwinkle Tower. Note that absolutely no climbing is allowed on any of the arches. To find some solitude in this busy park, head to the Klondike Buttes off to the northwestern end of the park. A nice gravel road leads to the area where you are free to roam and scramble up the buttes or hike to one of the arches behind them. 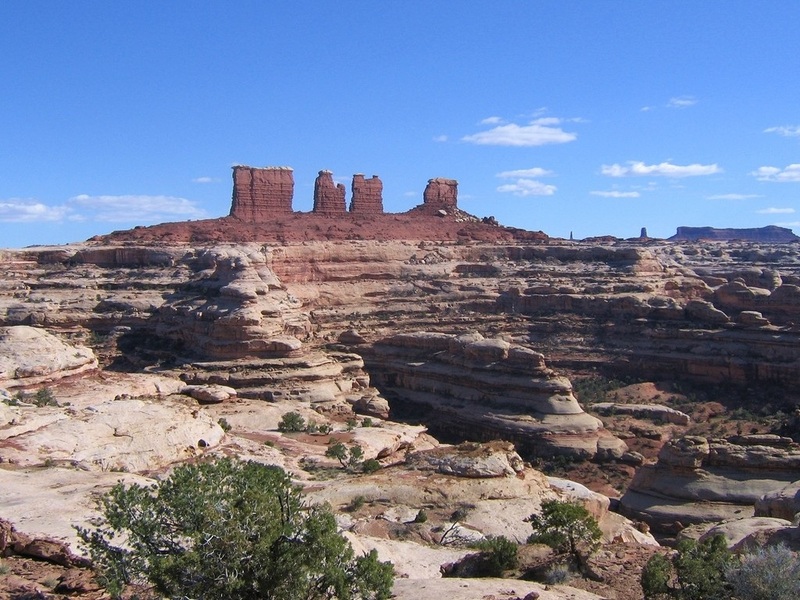 Canyonlands is a very extensive park with three districts. The Island in the Sky District is the most accessible and sits at the north end of the park. The popular White Rim Road, at over 80 miles long is popular among bikers and off-road enthusiasts and makes for a great way to see this district. Mesa Arch and the Upheval Dome, along with the mysteries as to how it formed are the primary attractions here and can all be reached with short hikes. 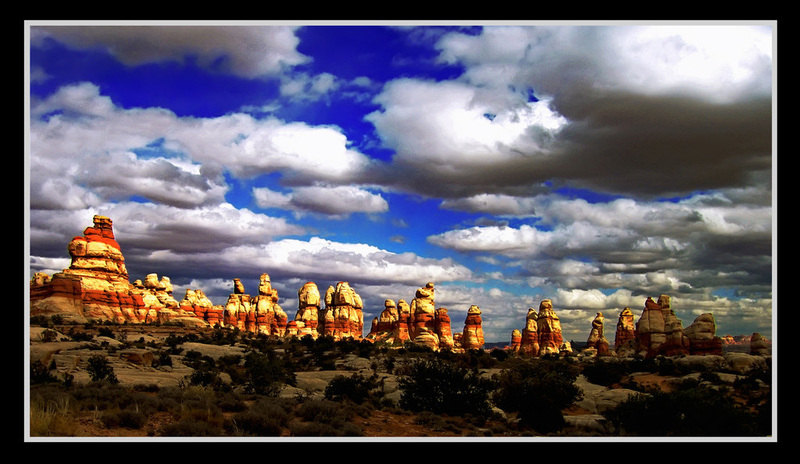 The second zone, which is also fairly accessible by heading south on Highway 191 from Moab is the Needles District. This zone is popular among backpackers as there are many trails that criss-cross the area. Canyons like Lost Canyon, Big and Little Squaw Canyons and Salt Wash can sometimes provide water. Elephant Canyon bisects the zone and begins at Druid Arch (must see) and gradually drains north and then drops steeply into the Colorado River. Many obscure arches and petroglyph panels are found here. The third district, known as The Maze, is very inaccessible and isn't technically part of the Moab area as you must approach it from the west off Highway 24 near Goblin Valley State Park. Then a 50+ mile drive on dirt roads is required to even get close. This area is very remote, and incredibly stunning. The Maze Overlook itself is worth the trip but you can backpack for days in the area exploring the many canyons and mesa tops if you know where to find water. Spanish Bottoms is a cool place to visit along the west side of the Colorado River just a few miles south of the confluence. The La Sal Mountains are a great place to escape the summer heat, and house nine ranked peaks over 12,000 feet, with the tallest being Mount Peale at 12,721 feet. All these peaks are fairly easy walk up peaks with great views. Mount Peale is even an ultra-prominence peak as it has over 5,000 feet of prominence. In the fall, a spectacular color display of aspens are at their peak and cannot be missed! The most popular way to see this area is for people to drive the La Sal loop road, although taking one of the many hiking opportunities is a must. 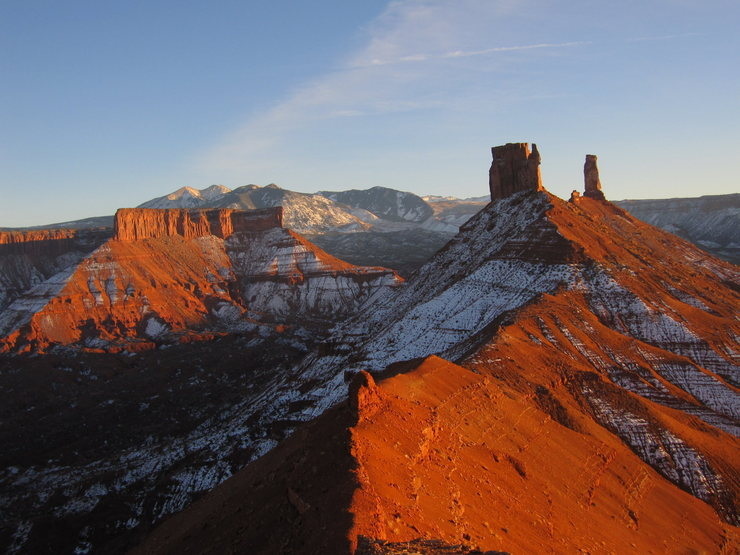 A list of the 12,000 foot peaks in the La Sal Mountains is below. This is the "other" valley located northeast of the Moab Valley. There are a handful of small farms and people living in this valley as well however it provides access to the world famous desert towers such as The Rectory, Castleton Tower, The Priest and more. Parriott Mesa is the easiest of all the routes accessed from this valley as it has fixed lines and goes at low 5th class. This is the very large, north-south oriented mesa you pass as you go up the Castle Valley Road (AKA the La Sal Loop Road). Great free camping can be found at the Castleton trailhead, which isn't much more than a hidden pull-off. You will miss it twice every time. Ah, the Fishers. So pure, so beautiful, so unbelievably awful, all at the same time. These towers are the real deal. Composed of the Cutler Formation, which is mainly a compacted mudstone, the rock is a disaster to climb on. Yet this place is talked about all by climbers all over North America and most people speak fondly of their adventures, or mis-adventures here. There are 5 major towers in this group, one of which known as The Titan is the tallest free standing rock tower in the country. Very few climbers have reached the top of all 5 towers. There are also a handful of other smaller towers that garner more interest. A decent list of the towers is shown below. The first 5 towers in the table are the 5 majors...Also note that The Cobra is left off since it no longer exists.